Christmas in July? What a strange concept. But it’s a real thing for brands, who need to showcase their Christmas products to the media. Every year London is alive with Christmas in July events and this year I got to go to a couple of them. 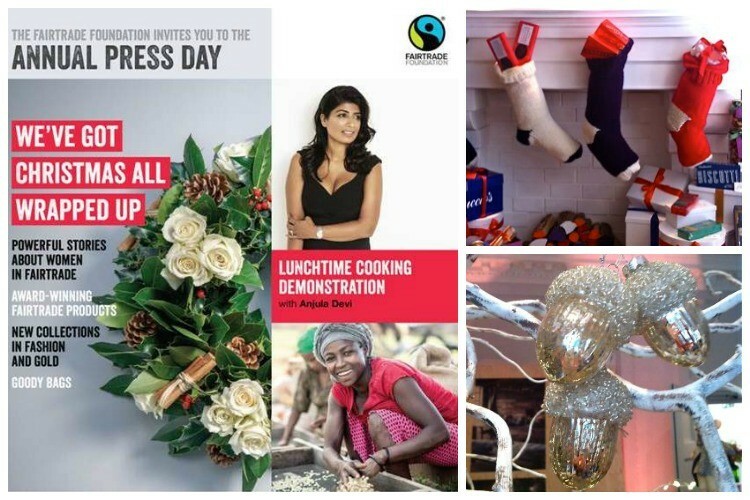 The main event for me was the Fairtrade Foundation’s press day which not only highlighted some of the Fairtrade products available, but had a cookery demonstration too. One of the bonuses of attending London events, is catching up with other food bloggers. This time I managed to hook up with Fiona from London Unattached. This was an enormous help as I no longer have the confidence I once had in finding my way around those streets paved in gold. Our first port of call was Carluccio’s, a chain of Italian restaurants founded by Antonio Carluccio. I’m a big fan of Italian food, but had never actually visited the Greedy Italian’s emporium before. Not only is the food known for being particularly good, but they also sell a range of Italian delicacies sourced directly from the producers. As the sun beat down upon us, it was a little surreal to be stepping through a snowy landscape to reach the haven of a room stuffed full of stockings, panettone, truffles, cantucci, fig jam, wine, olives, pasta and so much more. And when I say snow, I mean real fluffy flakes of frozen water. I had my first taste of panforte, a delicious confection of dried fruits, nuts and spices and I’m now totally smitten. Of all the delicious treats I tried, that was my favourite. The staff were all very helpful, knowledgable and charming and laid on quite a feast for us. Suitably laden with goodies and on our way to the Fairtrade event, we made a quick detour to the House of Fraser‘s Christmas in July; we sampled more delicacies and had a quick whizz around the lifestyle items on offer. A gold and silver theme ran throughout and it all looked rather glamorous as well festive. I was rather astonished to find this stylish and elegant Biba leather bag in my goody bag. So to the main event. I’ve been a supporter of fair trade ever since I can remember and well before the Fairtrade Foundation came into existence in 1992. I’ve written about the excellent work the Fairtrade Foundation does many times before, so if you’d like to know more about what they do, please visit their website. It was fascinating to hear first hand from some of the producers how fairtrade is making a real positive difference to many people’s lives in some of the poorest parts of the world. The focus of this year’s campaign is a all about women, who produce 80% of the world’s food, but often have little power or autonomy. I heard how female coffee growers in Ethiopia have become financially independent and thus been empowered to improve living standards for themselves, their families and their communities. Grumpy Mule produces coffee grown organically by Ethiopian co-operative, YCFCU. The co-operative board consists of seven men and three women, which is more than many Western boards. Zinabua Birhanu is one of the board members and she says “I have equal say on the committee to the other members and whatever I say, I always defend my voice.” This coffee with its notes of Earl Grey and citrus is best drunk black, apparently. I’m a big fan of Steenbergs‘ spice mixes and have been known to fill up friends’ Christmas stockings with them. Their spices, tea and cocoa mixes are mostly organic and fairtrade. Sadly, they were not represented in person, but these cute little pots of organic fairtrade cinnamon were very much present. The gold and silver mining industries are notorious for dangerous practices and badly paid workers. Fairtrade gold ensures safer working conditions, a guaranteed price and improvements to local communities. Cred Jewellery produces beautiful pieces of personal ornamentation. They also pioneered Fairtrade for the jewellery industry back in 1996. They work directly with miners in Sotrami, Peru to encourage responsible mining practices, give fairer wages and improve local education, health and environmental conditions. I was pleased to hear that they speak to at least one miner by phone each week – no middlemen involved here. It was a real pleasure to meet Jemma from Divine. This is a company I’ve supported since its inception and I’ve showcased many of its chocolate products over the years. You can read a more in depth account on my post Divine Intervention. For this event, they were showcasing their Christmas chocolate advent calendars, new 12 mini bar chocolate tasting set and massive gold coins. I buy Divine’s chocolate coins every year at Christmas, but I think I might now be a convert to their giant 58g solid milk chocolate version. The tasting set includes a guide and flavour wheel to help you identify the various flavours and notes to be found in the chocolate bars. Desperate for a cup of tea when I arrived, I was kindly offered one by The London Tea Company. They had a wonderful range on offer, from fruit teas to herbals, to green to black. Some come in loose leaf form, some as pyramid tea bags and some as more traditional tea bags. I nearly went for rooibos, because that’s what I usually do, but at the last minute I spotted peach and rhubarb and plumped for that instead. I’m so glad I did, it was both refreshing and naturally peachy with a subtle note of rhubarb thrown in for good measure. I thought it would make a really good iced tea in the hot weather we were experiencing at the time, so as soon as I got home I made some. This health and beauty company is a new one on me. It makes body lotions and shampoos using Fairtrade natural vegan ingredients from around the world: olive oil from Palestine, green tea from India, almond and apricot kernel oil from Pakistan, argan oil from Morroco, coconut from Thailand and shea butter from Burkina Faso. I’ve reviewed Chocolate and Love’s award winning chocolate bars before, so it was great to find one of the co-founders was there to talk to. Richard himself was there and this was a great opportunity to get some background info on the story of Chocolate and Love, a romantic one of course. He’s obviously a discerning man, as he immediately offered me a piece of 55% milk chocolate. Dark milk chocolate is my absolute favourite, so he won me over immediately. From that, it didn’t take much to persuade me to try their 100% chocolate and to my surprise it was really quite palatable. Rich yes, but also smooth and not at all bitter. All of their chocolate is organic, Fairtrade and of excellent quality. The outer wrappers are beautiful and the inner wrappers are biodegradable. On the long train ride home, I took a peek into my goodie bag and found seven gorgeous Chocolate and Love bars had been included: sea salt & caramel, mint, coffee, creamy dark with cacao nibs, orange, Panama 80% and rich dark 71%. I’ve not tried them all yet, but the dark chocolate mint is like a sophisticated version of a childhood favourite of mine, Ice Breaker. Heaven indeed. Other companies represented included Café Direct, Eden Project, M&S, People Tree and Arniston Bay fairtrade wines. As I mentioned earlier, I had a cookery demo to look forward to. Anjula Devi is both a cook, teacher and supporter of Fairtrade. She likes to prepare healthy and delicious Indian dishes and spices are very much her thing. In fact, she has a cookery book Spice for Life coming out next year. It was wonderful to meet her, she was utterly charming and full of life and vibrancy. The spices which she favours for their health giving properties seem to have worked their magic on her. As luck would have it, she was making a gluten free banana coffee chocolate cake and what a delightful cake it turned out to be. I’ll be making it myself and posting the recipe on the blog at some point, so you’ll get to see it properly then. Anjula needed a helper at one point to mix the cake, so yours truly stepped into the breach. She also made a fabulous vegetable curry, which disappeared almost as soon as she made it. The photo above is of Anjula and Jemma from Divine whose chocolate was used. All in all I had a fabulous day and learnt a lot. Fairtrade has always been close to my heart, but when you hear some of the stories of how it directly affects people, it’s incredibly moving. As for Christmas in July, well I might just have to spend more than a few hours in London next year. I’m a huge fan of Steenbergs, they make the best spices! And I’m getting some Divine chocolates sent to me soon, very excited to try them! The christmas events are indeed fun but so tiring ,especially as all the brands run them on the same few days. Yes, I was exhausted after just these three Nayna, but they were good fun and I’m really pleased I made the effort to come up. You are a lucky girl to have this wonderful day out! I am so envious!! Living down this end of the world we don’t see much of these sorts of ‘goodies’. By the time Panettone gets to us by Christmas it is already several months old!!! I hope you continue to enjoy your goodie bags and I am sure we will see them reflected in your future recipes. Thankyou for sharing your day out with us. Yes it’s true, Christmas for you is very different Mary. I spent one in NZ a few years ago and we were strolling around in the sun eating ice-cream on Christmas Day, it didn’t feel right at all. For the last few years we have been able to come ‘home’ for a wintery Christmas. I keep ordering snow but we have always experienced really warm weather. Hoping for snow this coming Christmas. Love being in the Northern Hemisphere for the festive season with all the hustle and bustle. Can’t remember the last time we had a snowy Christmas. Hopefully you’ll get lucky this year. Yes, very good point Johanna. I can see your point. I have experienced a Southern Hemisphere Christmas – we strolled around in the sun eating ice-cream. It seemed very weird and not at all like Christmas. As for the cake, I didn’t witness the slicing, but I did get to try some and it was very good. Yes, it was definitely rather strange, especially with the snow melting fast in the sun, but it was fun nevertheless. Oh no Lucie, an all year around Christmas might just be a bit too much! Precisely GG, fresh and fragrant spices aren’t always that east to get hold of I’ve found. I really love the whole ‘Christmas in July’ weeks. The Fairtrade show was really interesting though wasn’t it! It really was Heidi, far more to it than straightforward commercialism. I love learning about new fair trade and sustainable brands! Such a great thing to support! Glad you think so too. It’s great to see a more diverse range of Fairtrade products, there’s so much more out there now. You did have a Christmassy day! Divine chocolate is my favourite!